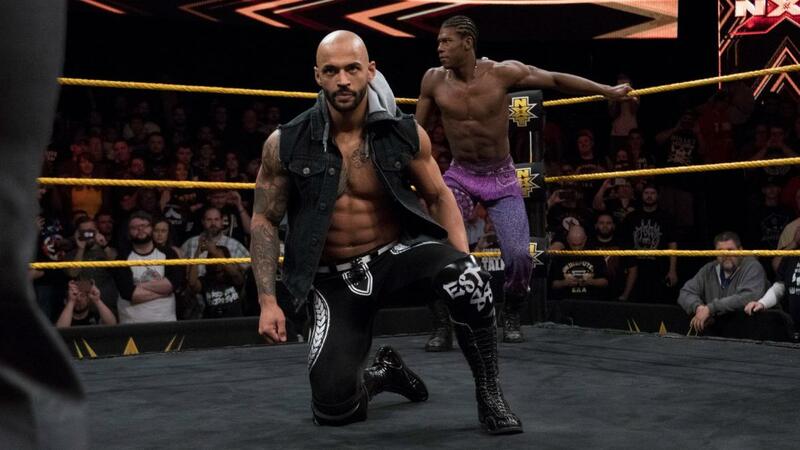 On 4th April 2018, WWE aired its 294th episode of NXT, filmed at Full Sail University in Winter Park, Florida on 7th March and the last episode before NXT TakeOver: New Orleans. 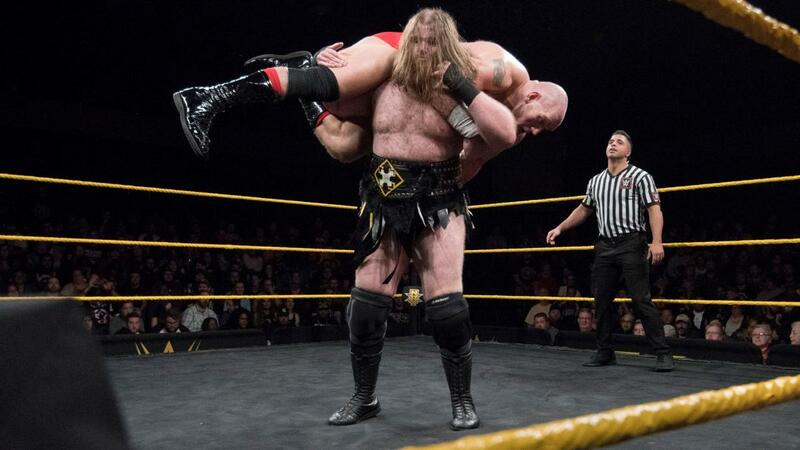 Our main event was an encounter between the 'Physical Freak' Lars Sullivan and the 'Beast of Belfast' Killian Dain, two of the competitors in Saturday's Ladder match. We also had our Dusty Rhodes Tag-Team Classic final between Pete Dunne & Roderick Strong and Authors of Pain, as well as Kairi Sane vs Vanessa Borne. Going into what is the second biggest event of the year for NXT, this had a lot riding on it to take us home in style, But was it any good? There was an interesting cycle of intent to this match as last time Roderick Strong was in the ring with the Authors was the WarGames match when he stood alongside them but the aim has always remained the same - to dismantle The Undisputed Era. Equally interesting is the fact that no one on commentary thought to mention this. Despite not having a conclusive ending, this is still a match of two halves as it didn't really kick into gear until the Roderick Strong hot-tag. There was a weird atmosphere as you have basically tweener Dunne playing the (surprisingly effective) bruiserweight-in-peril as the Authors work him over with a faintly uninspired heat section but the crowd were half-behind the big murder men, possibly they are mistaking babyface for actually having baby faces, also for this, see Braun Strowman. As previously mentioned, when the Strong hot-tag kicked in, there was no doubt who the crowd were behind as the tag wasn't the only thing that was hot. I'm on about the crowd, not Roderick's chiseled chin (though that thing sure is chiseled). The fascinating thing about Strong x Bitter is how over three short-ish matches, they've really begun to gel and find a certain continuity between performances. 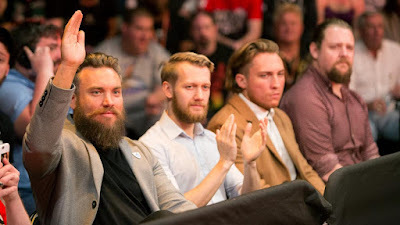 They still aren't as cohesive as Dunne is with Mark Andrews or Trent Seven or Strong is with Austin Aries but they've really managed to carve a niche in the division and the double team Bitter End they've been using is a thing of beauty. Just as the match was really hitting a good bit, Adam Cole and Kyle O'Reilly crashed the ring, attacking all four competitors, leading to a Double Disqualification. I don't have a problem with a screwy finish like this as such as it seems completely in character for The Undisputed Era, even though I can see how some might take umbridge with us not being given a good, clean finish here. It's odd that the problem I had with this match was the Authors as recent performances seemed to really show a massive up in quality of performances by them and this seemed like a slip back into old habits and weak heat. Hopefully another pre-Mania Triple Threat will bring out the best in them again. Cole & O'Reilly beat up everyone until they try and bail, William Regal appears and tells the Era that they thought they were being clever, making sure they had no opponents for their titles on Saturday but instead, now they have more than one and books a Triple Threat between The Era, Strong x Bitter & Authors of Pain for the titles and the Dusty Cup. We get a mighty fine video package for the NXT North American Championship Ladder match. Highlights of this include EC3 chilling by the pool, Velveteen Dream wearing a nice floral shirt and Killian Dain enjoying an oil-drum fire. We get an even better video package for Gargano v Ciampa which if it doesn't have you feeling misty-eyed, you feel nothing. Other plus sides of this, video and photos from Gargano's wedding giving us NXT cameos for 'Dustin' Chuck Taylor & M-Dogg Matt Cross. Seriously though, this was crazy good. The crowd of disembodied hands listen to Lacey Evans make a statement about her place in the Women's division. She does her standard thing: calls people trash, talks about her past as a marine and a mother, she saves her last words for Kairi Sane, stating that she will take her opportunity and show her what class looks like. The Undisputed Era complain to, or more exactly, at Regal backstage about him being unfair, Regal tells them they have three options: Cole competes in both matches, O'Reilly defends the tag titles alone, Cole gives up his spot in the Ladder Match. We get another excellent video package, this time for Almas v Black. The production team normally do sterling work on these but I have to give them extra credit for this week as they have gone above and beyond. We get a recap of Moon brawling with Baszler last week. Moon is interviewed afterwards, she's not sorry for what she did as Baszler was disrespecting a coach and acts like she deserves everything without earning it. Shayna started this but Ember is going to end it. Next Week: Kairi Sane vs Lacey Evans. The big thing of note here is that these two have shown that if the WWE wanted to run a G1-style big lads tournament, they could make it work as this was, for the most part, your classic super heavyweight clobber-off. They worked a good contest, especially considering neither men has exactly been known for doing much in the way of longer matches, except for in multi-man competition such as the NXT Championship Number One Contender's Fatal Four-Way where they first threw hands but they held their own and my attention, keeping the most of it quite simply being the two men trading strikes and power moves in an effort to assert dominance though neither men was able to actually get the upper hand. The finish, while the crowd loved it, seemed poorly thought out to me as the match was thrown out after the four men also in the ladder match hit the ring one after another and did a bit of shtick to increasingly loud pops. This wouldn't have been a terrible way to end an episode if they hadn't pulled the Double DQ finish to the Dusty Classic Final just at the beginning of the episode. Having an hour of TV with three short-ish matches, two of which have non-finishes feels a little like they're going too much in the way of 'keeping something for the pay-per-view'. That said, it was satisfying seeing how over each man's signature taunt is and I'm sure that sometime after TakeOver, we'll get a rematch betwixt these two that on the basis of this, could be really rather good. EC3 tells Cathy Kelly why he's going to be the one to win that shiny, new belt. Ricochet also tells Cathy Kelly why it is, in fact, He, who will be winning the shiny, new belt. SIt's an odd one because as an episode of television, it was slightly disappointing with two non-finishes to matches including a concluding moment to the show which was both exciting and deflating but also as a part of an ongoing story and a go-home show for Saturday's show, the lovely little video packages running through the show and the almost-preview matches for the Ladder and Triple Threat Championship matches really did make me more excited about what comes next. This wasn't a leap in itself but it was certainly a good lift-off, now let's hope they stick the landing.